Peculiarities of Dental Implant Insertion in Complex Anatomical and Topographical Conditions of the Mandible by Immediate Implantation and Immediate Occlusal Loading. The use of dental implants for supporting prosthetic rehabilitations has shown highly satisfactory results regarding restoration of the patient’s function and esthetics, as well as in terms of long-term survival. However, dental implants can lose supportive bone,even in cases of successful osseointegration. Peri–implantitis is probably one of the main causes of implant loss. 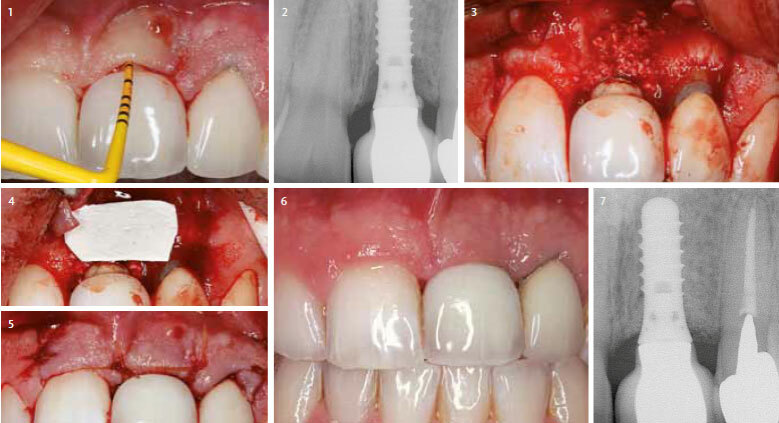 This article discusses the introduction, etiopathogenesis, diagnosis of peri-implant diseases, and the maintenance, care and treatment of peri-implant infection in osseointegrated implants. Implant complications can be due to a number of causes including prosthesis instability, implant mobility, occlusal trauma, fractured components, pain,inflammation, infection and neuropathy. Failure of implants may be described as early or late.Early failure follows shortly after placement and osseointegration is never really achieved. The main reasons behind early implant failures were improper preparation of the recipient site, bacterial contamination & extensive inflammation of the wound that may delay healing of the soft & hard tissues, improper mechanical stability of the implant following its insertion and premature loading of the implant. Late failure occurs in a successfully integrated implant some time after placement and subsequent restoration. The causes of late failure may be marginal infection/disease or biomechanical overload. Problems limited to the soft tissues surrounding implants and not involving the supporting bone have been defined as “ailing implants and more recently they are termed as biological complications. Healthy peri-implant tissue plays an important role as a biological barrier to some of the agents that cause peri-implant disease. If we compare the tooth and the implant, we see that the tooth is endowed with certain specific protective mechanisms such as: the junctional epithelium, connective tissue and cells belonging to the immune system. The epithelium and the interface between the supra-alveolar connective tissue and the titanium surface of an implant differ from the interface of the dental-gingival unit. The outer surface of the peri-implant mucosa is lined by a stratified keratinized oral epithelium that is continous with a junctional epithelium attached to the titanium surface by a basal lamina and by hemidesmosomes. The 2 mm long non keratinized junctional epithelium is only a few cells thick in the apical portion and separated from the alveolar bone by 1 to 2 mm of collagen rich connective tissue. This 3 to 4 mm. “biological barrier” protects the zone of osseointegration from factors released from plaque and the oral cavity. Peri-implant tissue presents a higher collagen fibre to fibroblast ratio in comparison to the tooth (a ratio of 4 in a tooth to 109 in the implant). Different etiological factors play an important role in the development and emergence of a periapical implant lesion. As a retrograde peri-implantitis is often accompanied by symptoms of pain, tenderness,swelling and/or the presence of a fistulous tract, two types of lesion can be distinguished: the disease active periapical implant lesion; and the disease inactive periapical implant lesion.9 Lesions are called ‘inactive’ when the radiological findings are not comparable with the clinical findings and/or the patient’s symptoms. A clinically asymptomatic, periapical radiolucency (which is usually caused by placement of implants that are shorter than the prepared osteotomy)is to be considered as inactive .When an implant is placed next to a pre-existing, detectable radiolucency, which is related to scar tissue, this also can lead to an inactive lesion.9 An inactive lesion can also be caused by aseptic bone necrosis,frequently induced by overheating the bone during osteotomy preparation. Overheating is mentioned asa risk factor for bone necrosis.9 This can eventually compromise the primary stability of the dental implant. Uncontrolled thermal injury can result in the development of fibrous tissue, inter positioned at the implant–bone interface, compromising the long term prognosis of the implant. An ‘active’ periapical implant lesion can be caused by bacterial contamination during insertion or by premature loading leading to bone micro fractures before an adequate bone-to-implant interface has been established. Implant insertion in a site with pre-existing inflammation (caused by bacteria, viruses,inflammatory cells and/or cells remaining from a cyst or a granuloma) can also lead to an active periapical implant lesion. These lesions are initiated at the apex of the implant but have the capacity to spread coronally and facially. Furthermore, retrograde peri-implantitis should not be mistaken for nonintegration. When, during placement, the apex of an implant touches the tooth and/or when the implant is inserted in an active endodontic lesion from an adjacent tooth, the implant may even exfoliate. Sussman & Moss9 described two basic pathways of periapical implant pathology: type 1, the implant-to-tooth pathway; and type 2, the tooth-to implant pathway. In the type 1 pathway, the implant -tooth lesion will develop when implant insertion results in tooth devitalization (as a result of direct trauma or indirect damage). This may occur when the implant is placed at an insufficient distance from a neighboring natural tooth or by overheating the bone during osteotomy preparation. When the osteotomy causes direct trauma to the apex of a natural tooth, it might destroy the blood supply to the pulp.The resulting periapical tooth lesion will contaminate the implant.9 In the type 2 pathway, the lesion will occur quite shortly after implant insertion when an adjacent tooth develops a periapical pathology(caries involvement, external root resorption, reactivation of a previously existing apical lesion or the removal of an endodontic seal .The majority of authors consider an endodontic pathology of the natural tooth at the site of the implant (or an adjacent tooth) to be the most likely cause for periapical implant pathology. Brisman et al10 reported that even asymptomatic endodontically treated teeth with a normal periapical radiographic appearance could be the cause of an implant failure.They also suggested that microorganisms may persist,even though the endodontic treatment is considered radiographically successful, because of inadequate obturation or an incomplete seal. Inflammation is a complex reaction of the body in response to an infectious agent, antigen challenge, or injury. Within 10 to 20 days of plaque accumulation on teeth, clinical signs of inflammation can be seen. The cells in the inflammatory lesion cause considerable tissue damage in their effort to combat the invading microorganisms. Degradation of connective tissue is followed by epithelial migration and bone resorption which marks the borderline between gingivitis/mucositis and periodontitis/peri-implantitis. Berglundh et al14 reported that there were numerous polymorphonuclear cells in the connective tissue areas adjacent to the pocket epithelium and in the perivascular compartments in more central areas of the inflammatory cell infiltrate among which plasma cells dominated. Experimental & clinical evidence by Hadeen et al 199815 support the concept that excessive biomechanical forces may lead to high stress or micro-fractures in the coronal bone to implant contact & thus lead to loss of osseointegration around the neck of the implant. The implant is placed in poor quality bone. The implant’s position or the total amount of implants placed does not favor ideal load transmission over the implant surface. The patient has a pattern of heavy occlusal function associated with parafunction. The prosthetic superstructure does not fit the implants precisely. According to Stuart et al in 2012,16 Peri-implantitis is classified into early with PD ≥ 4 mm (bleeding and/or suppuration on probing) and bone loss < 25% of the implant length, Moderate with PD ≥ 6 mm and bone loss ranging from 25% to 50% of the implant length and finally Advanced with PD ≥ 8 mm and bone loss > 50% of the implant length.The signs and symptoms which are typical for peri-implantitis lesions: radiological evidence for vertical destruction of the crestal bone. The defect is usually saucer shaped and there is osseointegration of the apical part of the fixture; vertical bone destruction associated with the formation of a peri-implant pocket;bleeding and suppuration on probing; possible swelling of the peri-implant tissues and hyperplasia; and pain is an unusual feature, which, if present, is usually associated with an acute infection.An estimation of the prevalence of peri-implantitis is difficult and depends upon the criteria used to separate health from disease. A mean crestal bone loss of 0.9-1.6mm is expected during the first post-surgical year and then a yearly loss of 0.02-0.15mm subsequently. The diagnosis of peri-implantitis needs careful differentiation from peri-implant mucositis, primary failures to achieve tissue integration and problems lacking an inflammatory component. This includes ruling out unusual anatomical features, unusual tissue morphology, hyperplastic responses and exposure of parts of the implant due to recession or surgical trauma. Since periimplant infections represent lesions originating from the marginal periimplant sulcus, the bone loss encountered in association with the development of such infections is also observed to be marginal and results in the formation of intrabony defects. This, in turn, means that the implant still remains fully osseointegrated in the apical portion, and hence, an increase in implant mobility cannot be expected. Therefore, increase in clinical mobility is not at all a sensitive parameter for monitoring clinical stability. Assessment of implant mobility in routine evaluations and clinical monitoring of implants is, therefore, not essential, but when used must always be performed in conjunction with the evaluation of other parameters. A clinical instrument was developed to analyze resonance frequency by using a new unit called implant stability quotient (ISQ). ISQ replaces hertz which is dependent on the transducer used, and is recorded as a number between 1 and 100, 100 representing the highest degree of stability. Transducers are designed for specific implant types and calibrated by the manufacturer. ISQ levels for successfully integrated implants are reported from 57 to 82, with a mean of 69 ISQ after 1 year of loading. Finally, OSSTELL (Integration Diagnostics, Sweden) is a new Food and Drug Administration–approved device that uses resonance frequency analysis to assess implant stability. The reliability and usefulness of the device in implant dentistry still are being evaluated. The correlation of biochemical markers of inflammation with clinical parameters of healthy peri-implant tissues and implants showing signs of peri-implant disease has been the focus of recent research. Levels of biochemical mediators secreted into the PICF have been studied with the aim of identifying a diagnostic marker to monitor peri-implant health .Analysis of the fluid in the periimplant sulcus reveals certain early changes that demonstrate the existence of bone resorption, for instance, increased levels of chondroitin sulfate, elastase, β-glucuronidase, aminotransferase and prostaglandin E2 levels. Recording of gingival temperature and peri-implant fluid volume are other testing procedures that are elevated in the presence of periimplantitis. In evaluating the bony structures adjacent to the implants over long periods of time, conventional radiography is a widely applied technique in clinical practice. However, it should be noted that minor changes in bone morphology in the crestal area may not be revealed until they reach a significant size and shape. Nevertheless, DIB (the Distance from the Implant shoulder to the alveolar Bone crest) represents a reliable radiographic parameter for long term monitoring in clinical practice provided that optimal exposure geometry has been achieved. Usually, the apical termination of the cylindrical part of implant fixtures is used as a reference point in two stage systems, despite the fact that subcrestal placement utilizing a countersink procedure is recommended for most submerged implant systems. The use of computer assisted image analysis such as subtraction radiography may improve the diagnostic accuracy (sensitivity) of radiographs as it allows detection of small changes in bone density In digitizing radiographs of identical exposure geometry, minute changes in the level and density of the alveolar bone may be revealed by subtracting subsequent images from a baseline radiograph. For clinical research, DSR is highly recommended and has been successfully applied in longitudinal studies. Multi-slice computer tomography and cone beam volume imaging have been used in implant dentistry offering the advantage that osseous structures can be represented in three planes, true to scale and without overlay or distortion. Depending on continuing diagnosis during maintenance, developing periimplant lesions should be treated according to the Cumulative Interceptive Supportive Therapy (CIST) protocols. IST includes as a first sequence mechanical, antiseptic and antibiotic treatment to control ongoing infection. Following this, periimplant bony lesions may be corrected by regenerative or resective surgical techniques. It is evident that preventive measures have to be reinstituted following such therapy. Oral implants with evident plaque or calculus deposits adjacent to only slightly inflamed periimplant tissues (BOP positive), but lacking suppuration and having a probing depth not exceeding 3 mm, are to be subjected to mechanical debridement. While calculus may be chipped off using carbon fiber curettes, plaque is removed by means of polishing using rubber cups and polishing paste. Carbon fiber curettes do not sever the implant surface, but are sharp and strong enough to remove light to moderate calcified deposits on implants. Conventional steel curettes or ultrasonic instruments with metal tips leave severe damage on the implant surface and render it conducive to future plaque accumulation, hence should not be used. A powered air abrasive system, based on a low-abrasive amino-acid glycine powder, has been demonstrated as an effective method of biofilm removal from the root surface, without damaging hard and soft tissues and it has been recommended for debriding implant surfaces. In addition to performing supportive therapy protocol A (i.e. mechanical debridement), antiseptic treatment is performed in situations where in addition to the presence of plaque and BOP, probing depth is increased to 4–5 mm. Suppuration may or may not be present. The antiseptic treatment (protocol B) is performed in conjunction with the mechanical treatment (protocol A). Antiseptic treatment comprises the application of the most potent antiseptic available, i.e. chlorhexidine digluconate, either in the form of a daily rinse of 0.1%, 0.12% or 0.2%, or as a gel applied to the site of desired action. Generally, 3-4 weeks of regular administration are necessary to achieve positive treatment results. When probing depth values of the periimplant sulcus or pocket increase to 6 mm or more, plaque deposits and BOP are usually encountered. Suppuration may or may not be present. Such a periimplant lesion is usually radiographically evident. The antibacterial treatment approach must then include antibiotics to eliminate or at least significantly reduce the pathogens in this submucosal ecosystem. Prior to administering antibiotics, the mechanical (A) and the antiseptic (B) treatment protocols have to be applied. During the last ten days of the antiseptic treatment, an antibiotic directed at the elimination of gram negative anaerobic bacteria – e.g. metronidazole or ornidazole is administered. Periimplant infections were treated successfully and remained stable for a documented period of one year. Subsequently, prophylactic procedures were instituted to prevent reinfection. Hence, it appears that periimplant infections may be controlled successfully by cumulatively providing mechanical, antiseptic and antibiotic supportive therapy. Dennison et al carried out an in vitro study of the relationship between implant surface and decontamination technique, in which the decontaminating efficacy of air-power abrasives, citric acid solution, hydrogen peroxide and chlorhexidine on different implant surfaces (hydroxyapatite, titanium plasma and machined titanium) was assessed.21 They coincided with Zablotsky et al22 in their conclusions that air abrasion, using bicarbonate particles with saline solution is the best way to eliminate endotoxins and remains from all surfaces, and that 40% citric acid with a pH of 1 for 30-60 seconds is an effective means of decontamination for hydroxyapatite coated implants; chlorhexidine is not effective in these cases. They also determined that machined titanium surfaces are the easiest to decontaminate and that topical tetracyclines (the content of one 250-mg capsule mixed with saline serum until a creamy consistency is obtained) are the antibiotic of choice in these cases. Furthermore, it appears that tetracycline stimulates fibroblast growth in the affected area. Only if infection is controlled successfully, it is reasonable to discuss treatment approaches to either restore the bony support of the implant by means of regenerative techniques or to reshape the periimplant soft tissues and/or bony architecture by means of resective surgical techniques, depending on esthetic considerations and morphological characteristics of the lesion. So far, evidence that bone fill of periimplant defects resulting from previous periimplantitis may be achieved following anti-infective therapy and using the biological principle of guided tissue regeneration (GTR) (FIG.4,5,6,7) However, the re-osseointegration of a previously contaminated implant surface into regenerated bone has not yet been demonstrated histologically. Treatment with the combination of grafts and e-PTFE membranes may lead to bone fill and improved soft tissue conditions. Comparison of the overall outcomes of cases treated with grafts alone, e-PTFE membranes alone, or their combination – does not indicate a superiority to the combination. FIG 7: Resorbable membrane is placed over the bone graft and post –op radiograph after six months. A clinical situation characterized by the presence of suppurative exudate, overt BOP, severely increased peri-implant probing depth (usually > 8 mm. ), eventually reaching perforations or vents of hollow body implants, and may be associated with pain with a peri-implant radiolucency extending far along the outline of the implant, it can be concluded that the peri-implant infection has advanced to a degree where it cannot be controlled by the therapeutic protocols proposed above. Oral implants are anchored in the jawbone and yet penetrate the mucosa, reaching the highly contaminated environment of the oral cavity. Biofilms forming on all hard, non-shedding surfaces will also form on titanium implants. As on teeth, bacterial plaque will develop and trigger a host response, resulting in the development of mucositis. If plaque is allowed to accumulate over prolonged periods of time, periimplant mucositis may develop into lesions extending further apically, with associated loss of alveolar bone. Angular bony defects usually extending around the entire circumference of the implant may result, and are termed „periimplantitis“. The periimplant mucositis lesion is characterized by BOP and periimplant sulcus depth of usually 2–4 mm. Periimplantitis, however, yields increasing probing depth, with occasional suppuration and radiographic loss of crestal bone. However, clinical stability is not yet jeopardized, since the implant affected is not mobile as yet. 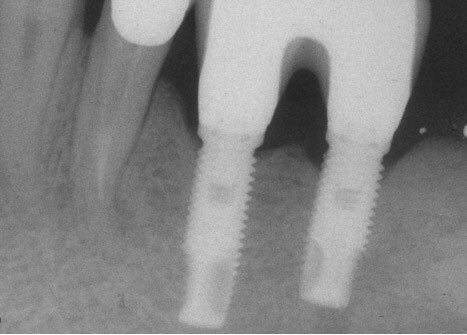 Osseointegration in the apical portion of the implant usually persists. Owing to the infectious nature of periimplant mucositis and periimplantitis, preventive procedures have to be rendered in a well-organized recall program to assure adequate supportive therapy for a lifetime. Sanchez G, Gay-escoda C. Periimplantitis. Med Oral Patol Oral Cir Bucal 2004;9 Suppl:S63-74. Lang NP, Wilson TG, Corbet EF. Biological complications with dental implants: their prevention, diagnosis and treatment. Clin Oral Impl Res 2000: 11 (Suppl. ): 146-155. Roos-Jansaker A-M, Renvert S, Egelberg J. Treatment of peri-implant infections: a literature review. J ClinPeriodontol 2003; 30: 467–485. Klinge B, Hultin M, Berglundh T. Peri-implantitis. Dent Clin N Am 2005; 49(3): 661-676. Mombelli A, Van Oosten MA, Schurch E Jr. Et al. The microbiota associated with successful or failing osseointegrated titanium implants. Oral MicrobiolImmunol 1987;2;145-151. Tonetti M. Peri-implantitis: biologic considerations. J ParodontolImplantolOrale 1996:15:284-296. Mombelli A, Marxer M, Gaberthuel T, et al. The microbiota of osseointegrated implants in patients with a history of periodontal disease. J ClinPeriodontol 1995:22:124-130. Mombelli A, Van Oosten MAC, Schu¨ rch E, Lang NP. The microbiota associated with successful or failing osseointegrated titanium implants. Oral MicrobiolImmunol 1987: 2;145–151. Sussman HI, Moss SS. Localized osteomyelitis secondary to endodontic-implant pathosis. A case report. J Periodontol 1993: 4: 306–310. McAllister BS, Masters D, Meffert RM. Treatment of implants demonstrating periapical radiolucencies. PractPeriodontics Aesthet Dent 1992: 9: 37–41. Quirynen M, Listgarten M. The distribution of bacterial morphotypes around natural teeth and titanium implants ad modumBranemark. Clin Oral Implants Res 1990;1:8-13. Tanner A, Maiden MF, Lee K, et al. Dental implant infections. Clin Infect Dis 1997:25(suppl 2):S213-217. Berglundh T, Gislason O, Lekholm U, et al. Histopathological observations of human periimplant lesions. J ClinPeriodontol 2004;31:341-347. Hadeen G, Ismail Y, Garrana H, et al: Three-dimensional finite element stress analysis of Nobelpharma and Core-Vent implants and their supporting structures. J Dent Res 1998; 67:286 [abstract]. Stuart F, Paul F.A Proposed Classification for Peri-Implantitis. Int J Periodontics Restorative Dent 2012;32:533–540. Mombelli A1, Mühle T, Brägger U, Lang NP, Bürgin WB Comparison of periodontal and peri-implant probing by depth-force pattern analysis. Clin Oral Implants Res. 1997;8(6):448-54. Leonhardt A, Renvert S, Dahlen G. Microbial findings at failing implants. Clin Oral Implants Res 1999;10:339-345. Mombelli A, Lang NP. The diagnosis and treatment of periimplantitis. Periodontology 2000:1998;17:63-76. Dennison DK, Huerzeler MB, Quinones C, Caffesse RG. Contaminated implant surfaces: an invitro comparison of implant surface coating and treatment modalities for decontamination. J Periodontol 1994;65:942-948. Zablotsky NH, Diedrich DL, Meffert RM, Wittrig E. The ability of various chemotherapeutic agents to detoxify the endotoxin infected HA-coated implant surface. Int J Oral Implant 1991;8:45-51. Walsh LJ. The use of laser in implantology: an overview. J Oral Implantol 1992;18:335-340.